Orphans by Thomas Benjamin Kennington (1885). An orphan called out for a punishment during a lesson in an Orphanage. An orphanage is a public institution for the care of orphans (children who have lost their parents). Orphanages often attempt to find homes for children in their care. They may be privately or publicly funded, and many are run by religious organizations. Today, orphanages are largely seen as an inferior alternative to foster care and adoption. 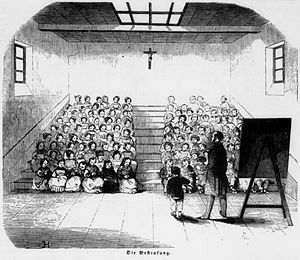 Like boarding schools, orphanages have a reputation to enforce comparatively strict rules that govern practically all aspects of the orphan's lives: bedtimes, dresscode, table manners, permissible language, hours to be spent for study, work, and leisure, and so on. These rules are usually enforced by means of reproval and punishment (the educators are allowed and expected to act in loco parentis). In the past and in many countries to the present day, this included corporal punishment, along with a wide palette of other punitive methods such as time-outs, extra chores, writing lines, and removal of privileges. Orphanages are not uncommon locations for novels (e.g. Oliver Twist by Charles Dickens), comics (e.g. Little Orphan Annie), and movies. Typically such works stress the strictness of discipline in orphanages and raise pity for the orphans who have not only lost their parents but are also raised by (sometimes) hard hearted educators. Orphanages are also featured in a few works of spanking literature. This page uses content from Wikipedia. The original article was at Orphanage. The list of authors can be seen in the page history. As with Spanking Art, the text of Wikipedia is available under a copyleft license, the Creative Commons Attribution Sharealike license.